The merits of the different connection methods in relation to data rates (bandwidth), complexity and transmission lengths are discussed in detail in the camera and acquisition technology sections. 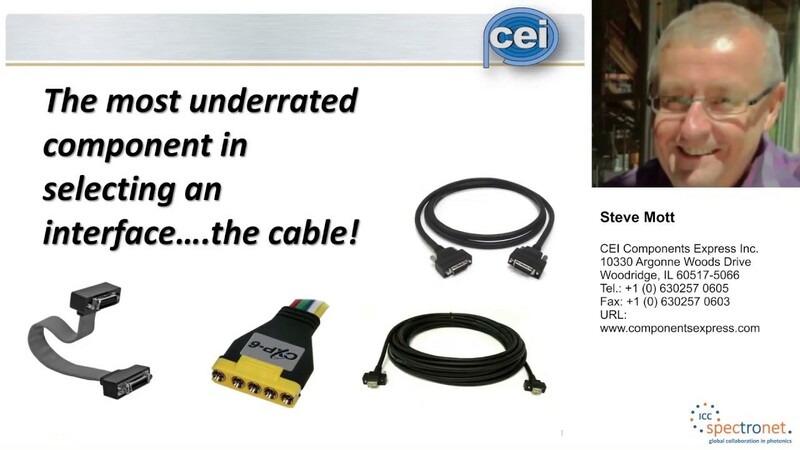 This chapter talks about the issues and considerations when selecting the correct cable for an application, regardless of the interfacing method used. Most cables have a degree of flexibility, in that you can bend them to fit into a system chassis or machine. For applications where the camera will be moving, standard cables are not sufficient, as they are not designed to withstand continuous bending and flexing over time. In these applications robot or track-grade cables should be specified. These cables are tested with repeated movements to simulate use on a robotic system or drag chain. The parameters that define this type of cable are: the minimum radius angle of the flex and the number of flexes in a given time period. In principle cables can be produced to any length within the constraints defined by the interface standard. For cost reasons we cannot stock any cable in any length, but we always have a range of standard lengths of the most common cables available for immediate delivery. However, our in-house cable design and build service enables us to promptly deliver any application specific cable length required. Interfaces such as USB and FireWire have no universally agreed locking standard defined. The connectors for these interfaces are often of a simple 'push-fit' design, making them problematic when used in industrial applications. However, as this type of cable is usually cheaper due to the large volumes manufactured, it is therefore often used despite the mechanical disadvantages. In close cooperation with camera and interface manufacturers we have succeeded in developing locking solutions for these interface types that are fully compatible with industrial imaging and the interface standards. Two choices of locking connectors exist, screw locks where screws fix the connectors together, and latching that have a push latch that needs to be depressed to remove the cables. We recommend using the screw type connectors if there is a choice, as they provide the most secure connection. Normally cables are bought off-the-shelf and not wired in-situ. Problems often occur when cables need to pass through bulkheads or tight places where cable connectors do not fit. Limited space therefore often leads to complicated cabling solutions. With many of the digital interface standards, the ability to self-wire cables is a very complex task and if not manufactured correctly can cause data errors. To overcome these problems we offer a range of angled and bulkhead connector solutions enabling easy implementation of difficult cable scenarios. We even supply customer specific cable assemblies through housings or core walls from our in-house cable design and manufacturing service. Speaker: Steve Mott, CEI Components Express Inc.
How to know when and why you are choosing the correct interface standard for your application. Understand the important limiting factors for your proposed vision system.